Firebox opening of 19-1/2" or 23-1/2" high x 24" wide. Fireplace surround kits measure 40" high x 31" wide (standard) or 46" high x 34" wide (large). Zero clearance housing for use with wood mantels available. Controls are concealed in front panel on surround. Get Harman Stove Co. contact information plus see product stories we've published about the company. 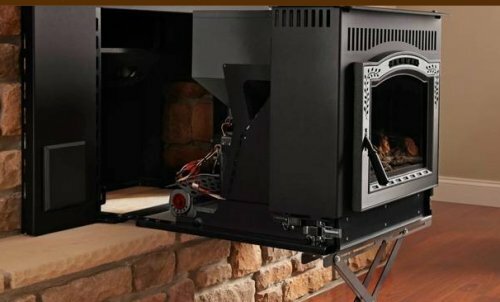 This compact pellet fireplace insert is attractive and versatile; it can burn wood pellets or a corn/pellet mix. But what you can't see might be just as impressive as the laser-cut decorative front that's visible. With an optional service rail system (pictured), the insert rolls cleanly out of the fireplace opening when it's time for annual maintenance. Although it's intended to heat smaller spaces, the insert can hold up to 62 pounds of fuel (41 pounds for a smaller model) and throw up a maximum of 35,000 BTUs per hour. Full automatic, the insert allows precise temperature control. It will even turn itself off and reignite as needed. The insert is available in 19-1/2" and 23-1/2" models to accommodate various fireplace openings. Coordinating trim kits are also available.